Denny Hamlin finished second to race winner Clint Bowyer in Saturday night’s NASCAR Sprint Cup Series race at Charlotte Motor Speedway in the #11 FedEx Ground Toyota to close the gap on points leader Brad Keselowski as the 2012 Chase for the championship reached the halfway mark. Hamlin was able to stretch his fuel the distance with just one pit stop over the final 110 laps to take the checkered flag just 0.417 seconds behind Bowyer after the majority of lead lap cars were forced to make two stops. 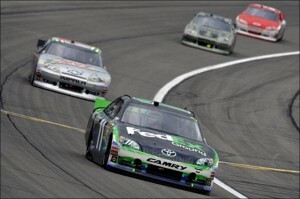 Hamlin started ninth in the 334-lap event at the 1.5-mile oval, quickly working to the front in the early going. After a handful of early cautions, the #11 machine settled into the top-three for the second-third of the race, leading twice for 36 laps. The final caution came on Lap 224 shortly after many cars had made green flag pit stops, and crew chief Darian Grubb brought Hamlin back down pit road — giving up third-place in the process — in order to get the team close to its fuel window for one more stop and hope the remainder of the race was run under green flag conditions. The finish kept Hamlin third in the Chase standings following Charlotte, 15 markers behind Keselowski after five of 10 playoff races. Jimmie Johnson is third, eight points ahead of Hamlin. The Series heads to Kansas Speedway for Sunday’s 500-mile event at the 1.5-mile quad oval. In the spring race at the track, Hamlin passed Martin Truex Jr. with 31 laps remaining and held him off en route to the checkered flag in the #11 FedEx Ground Toyota, winning his second race of the 2012 season. The decisive move came in Turn 3 on Lap 237 shortly after the final round of green flag pit stops at the 1.5-mile speedway, when Hamlin dove to the inside of Truex Jr. and cleared him off of Turn 4 to capture his 19th career Cup Series victory. Hamlin started fourth and never ran outside the top-10 during the 267-lap event. Hamlin owns three top-five finishes in nine career Kansas starts, including a fourth-place result in the 2009 Chase event. He made his first-career Cup Series start in Oct. 2005 at the track, starting seventh and finishing 32nd. The Kansas City FedEx Freight district will be recognized with its “KCY” code letters on the b-post of the #11 FedEx Freight Toyota this weekend at Kansas Speedway. FedEx Freight Priority now has the fastest published transit times of any nationwide LTL (less than truckload) service. How do you think the Kansas Speedway repave is going to affect the race on Sunday?